Assam Chief Minister Sarbananda Sonowal addresses an election rally at Sipajhar. (File Photo) credit: Northeast Now. Assam Chief Minister and BJP leader Sarbananda Sonowal continues to accuse the regional Asom Gana Parishad (AGP), an ally in the BJP-led coalition government in the state, of having ‘close link’ with the Opposition Congress. Addressing an election rally at Deormornoi village under Sipajhar Legislative Assembly Constituency (LAC) in Darrang district just few hour before the campaign came to an end for the first phase of the Panchayat polls scheduled for December 5, Sonowal launched attack on the AGP for ‘maintaining a close connection’ with the Congress whom the regional party apparently had been opposing since long. 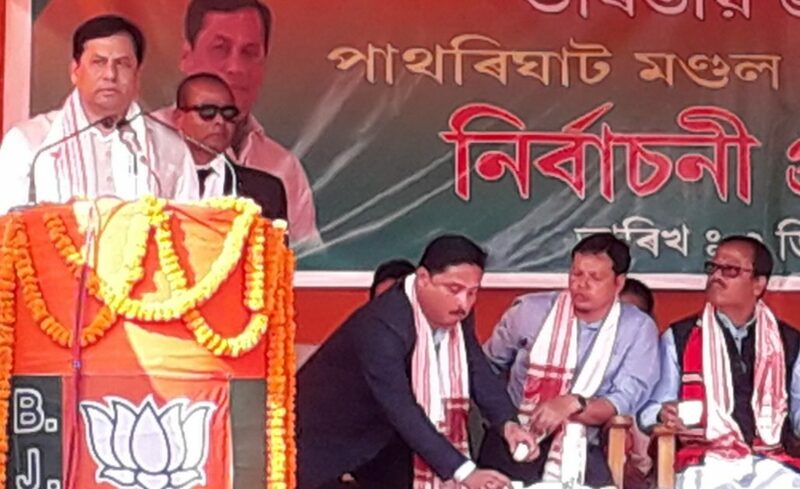 Sonowal said, “Now the relation between AGP and Congress is such that reaction to a comment from the BJP against AGP has been issued from Rajiv Bhawan, not from Ambari (AGP headquarter)”. The Chief Minister also lambasted the Congress for indulging in massive misappropriation of public fund in the Panchayati Raj system while it was in power in the state thereby hampering the entire development process of the rural Assam. He appealed to the voters to elect the saffron party into power in Panchayati Raj bodies to pave the way for setting up of a corrupt-free, value-based Panchayat Raj system in the state. The rally was also addressed by BJP MP from Mangaldai Lok Sabha Constituency, Ramen Deka and Sipajhar Legislator Binanda Kumar Saikia among other party leaders . The Chief Minister flew in a chopper from Golaghat to address the rally today. Meanwhile, an election rally organised by the Pathorighat Mandal of BJP in the play ground of Deomornoi Higher Secondary School forced the school authority to stop holding classes for the day in the school and send students home well before the end of scheduled school time.